Children will too often fall victim to the hunger and poverty of underdevelopment. This is especially true for indigenous children who live in rural areas in Latin American countries, isolated from other national communities. Many United Nations programmes and agencies are involved in helping these children integrate by organizing country-wide programmes touching education, health care and child care. 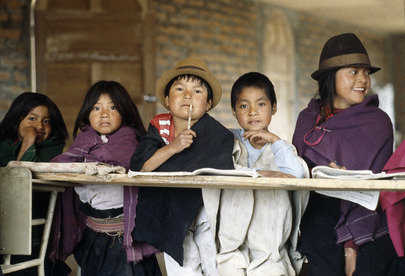 Young Salasaca Indians in Ambato, south of Quito.